What is My Mac Speedup? 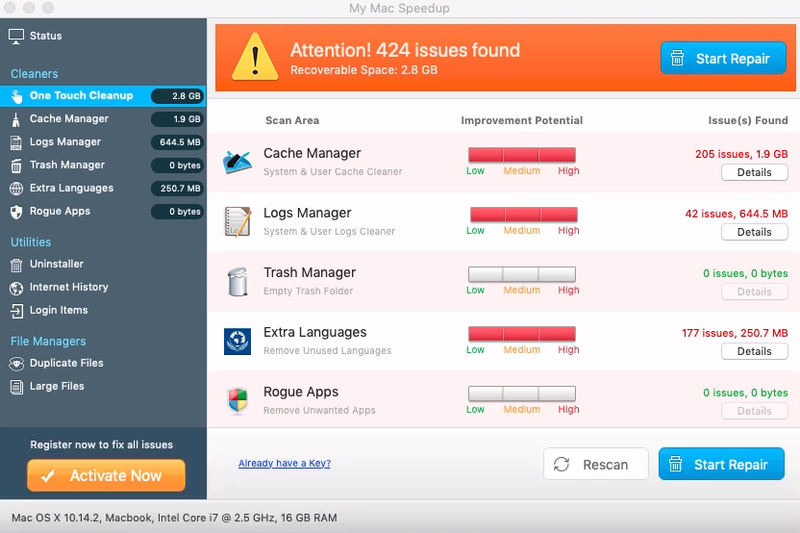 My Mac Speedup is a Potentially Unwanted Program, that claims to boost your Mac computer’s performance by fixing registry issues, removing temporary files with malware and optimizing your system. Though it will demand payment after scanning your system in order to “help” you with your system’s issues. However, it’s not true, probably there is nothing wrong with your computer, the program is not going to help you, so don’t buy the full version of this app. In this article we’ll explain how to remove My Mac Speedup. The only and one purpose of such applications is to earn easy money without doing any good to you. Completely opposite, My Mac Speedup will corrupt your computer’s work as it will generate pop-up ads, slow down your computer’s performance and show you frightening messages. Don’t trust this application, as all of their scary pop-up messages are blind threat. How My Mac Speedup infects your PC? My Mac Speedup is usually promoted among a lot of non-reliable websites as a good tool to optimize your PC. When searching how to fix some error, this websites will show up in your web searches. When installing something you’ve just downloaded from the internet, be very careful, check license agreement properly. Always choose Custom or Advances installation type, as it can prevent you from having badware on your computer. Stay sharp, get a proper anti-virus program and you’ll be safe from most of the threats. Bundling method: this method is the most common in badware distribution. Cyber criminals put in the badware to some free software applications. The user downloads this program and install it, but the malicious program also getting into your computer. Try to avoid visiting suspicious websites, they can infect your PC with My Mac Speedup easily. How to remove My Mac Speedup from your computer? 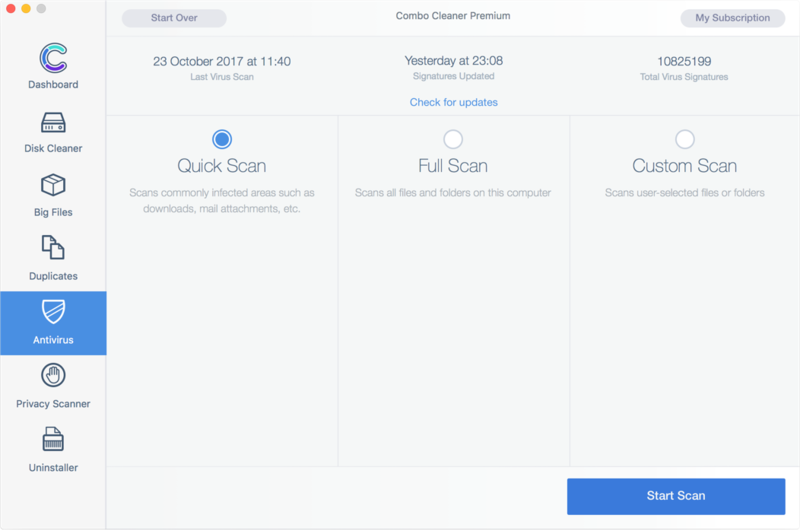 Download this anti-malware application for Mac in order to remove My Mac Speedup automatically. Simple, effective and user-friendly. In order to get rid of My Mac Speedup, first thing you need to do is to uninstall malicious program from your Mac computer. When removing My Mac Speedup, try to find suspicious recently installed programs and delete them too, as it’s pretty common that any malware comes with some other unwanted programs. Search for My Mac Speedup or My Mac Speedup Uninstaller, then choose it and follow instructions. Once you’ve uninstalled the application, remove My Mac Speedup from your web browser. You need to search for recently-installed suspicious add-ons and extensions. Search for suspicious and unknown extensions that may be related to My Mac Speedup. Search for My Mac Speedup. There are all the manual instructions that will help you to find My Mac Speedup on your Mac computer and remove it. The most effective method to get rid of My Mac Speedup is to perform the manual removal instructions and then use CleanMyMac automatic tool. The manual method will weaken the malicious program and the program will remove it. Thank you for your attention.